Painting a wrought iron fence provides essential protection for the metal while at the same time restores the original color. The fact of the matter is that everything including metal will break down over time. Metal railings that have become exposed due to paint failure will combine with oxygen to form corrosion otherwise known as rust. Over time, as corrosion continues to build up, it will cause the metal to expand further breaking apart protective layers of paint. It is always best to treat corrosion and maintain metal railings in order to avoid extensive rust abatement techniques. The good news is that corrosion can be effectively removed from metal railings by using a variety of methods. Depending upon the severity of the rust corrosion, rust abatement could include thermal techniques, abrasive chemicals, and sandblasting. Electrolysis is more involved and can remove rust and oxidation without the use of grinders, scrappers or harsh chemicals. However, under most normal circumstances a wire brush and chemical cleaners that contain phosphoric acid, such as, naval jelly will suffice in removing corrosion. In late July, we were involved with a wrought iron rail restoration project in Oakton Virginia. The Home depicted in the photographs had extensive iron railings surrounding the pool and the second level balcony. The circular staircase had moderate rust corrosion at the base of the support columns, and some areas where there were welded joints. Additionally, the gate section of the fence had a moderate amount of peeling and flaking paint. Fortunately the standard rust abatement process was all that was required in order to properly maintain the rails. Surface Cleaning such as power washing is not always required, however, in this case there was some accumulation of dirt and debris on the iron railing. Wire Brush Cleaning included the use of hand wire brushes, and a power grinder in order to remove the loose rust and corrosion. Sanding Sponge Process of the entire railing, from top and bottom, eliminated flaking paint and provided a surface profile for improved paint adhesion. Rust Mitigation comprised the application of the phosphoric acid based naval jelly. This stabilized and converted the existing rust. Complete Prime Application was performed wherever scraping and sanding had occurred. We utilized Rustoleum Rust Inhibiting Metal Primer. Paint Application was implemented utilizing brush and roll techniques with Sherwin Williams Urethane Alkyd Industrial Enamel Black. In most cases, traditional wrought iron railings have a black color; however, it is possible to tint certain alkyd based enamel paint products. Sherwin Williams Urethane Industrial Enamel is is a new generation of alkyd based enamel which provides increased durability from the sun and outdoor elements. Also, the availability of alkyd paint is somewhat limited depending upon the EPA Regulations in your state. 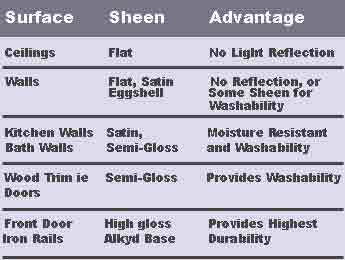 That being said, most major paint manufacturers offer one option in terms of alkyd based paint sheen- high gloss. This was a particularly rewarding project and the Home Owner was very pleased with the finished product. Throughout the fall months, we stayed busy completing several exterior carpentry projects. One of our Clients in Falls Church Virginia had a bay window with a very unique look that was designed with many architectural elements from the 1800’s. This bay window had some extensive wood deterioration that fortunately did not extend into the house framing. Additionally, the old double-hung windows that were part of the bay window were very drafty and not insulated, which contributed to a lot of cold air coming into the house. The side of the house where this bay window is located is right next to the watershed of the entire townhouse development. The area has a lot of trees with little sun, animals and critters, water, and tons of mud everywhere. Unfortunately for the homeowner, what had happened was that nature and the elements had started to re-claim his house. Although we could see many issues from the ground, a complete Power wash cleaning and thorough carpentry inspection was required before we could provide him with an estimate. There were several places within the bay window cornice work that were so completely deteriorated that there were holes exposing the house framing. All three window sills were entirely shot, and it felt like a sponge when you pressed down on it. The panels were also constructed with MDF which is sort-of a cardboard composite. All of these panels were warped. And on top of all of that, carpenter bees had bored-out several holes within the trim and had been hibernating inside when we found them. We carefully removed all of the cornice trim and rotted wood and unsalvageable parts of the bay window. After dismantling everything, we were left with about 15% of the original trim. 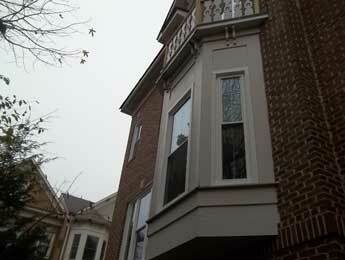 The windows themselves were replaced with Marvin double-pane tempered glass. The remaining 85% of the trim was replaced with complete sections of PVC up to 12” in width. Even the corbels and some detail soffit sections that had been protected from the elements, needed to be replaced with custom-milled sections. The type of PVC that was used is called Azek and it is basically plastic that will never deteriorate. This product is not inexpensive and they only sell 18 foot sections. These particular horizontal replacements were slightly more than 9 feet, which basically means that we had to purchase an entire 18 foot section for each horizontal. The PVC caulk to seal the expensive PVC cost about $11.00 a tube. Needless to say, the caulk and paint will deteriorate and crack, however the PVC will literally last forever! I'm very happy with the finished bay window and I enjoyed helping to recreate a bit of 19th Century craftsmanship. We used the most advanced materials for the job to bring back the character of the home’s exterior. When spring comes around and everything warms-up, we will return to apply the paint! In addition to museum quality painting, we also specialize in wood trim replacement and structural repairs. 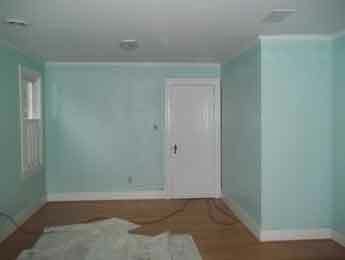 Please call or click Davinci’s Painting for more information and a free carpentry consultation.